We have all heard about carb loading before a race. 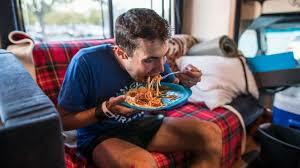 Many races serve a pasta dinner the night before a race, but does it really have that big of an impact on race day? It can if it is done properly. Why do we carb load? You want to fill your muscles with as much glycogen as you can before a race because that’s what your body uses to fuel itself while you run. There are two main ways to carb load. There is the traditional method, which is spread over three to six days before the race, and then the 24 hours binge. The traditional method goes something like this: from Sunday to Tuesday before the race you should consume fifty percent of your calories from healthy carbs. From Wednesday to Friday 70 percent of your calories should come from carbs. The 24 hour binge is not recommended and can make you feel sluggish rather than energized. It can give you GI issues as well and no one wants GI issues while they are running. The 24 hour binge is where you consume 4.5 grams of carbs per pound of your body weight the day before the race. If you do this, avoid eating foods high in fiber, add healthy fats and some protein to the mix to slow the release of the carbs and reduce blood sugar spikes. Carb loading is not necessary and comes with its own risks. There are so many products out there that make fueling during a run easy, carb loading may not be worth it. If you’re running less than 90 minutes carb loading won’t help you at all because it takes that long for most people to burn through their glycogen stores. Lastly, women don’t reap the same benefits from carb loading as men. The reason for this is believed to be the difference in hormones, estrogen in particular. All is not lost though, women can increase their calorie intake by thirty to thirty-five percent during the loading period and get the same or similar benefits.